VAIL — There isn’t much open land in Vail, although the town is surrounded by thousands of acres of public property. That shortage of land makes every piece important to someone. That’s why a plan for that land is taking a long time to create. After starting the process in 2016, and after several public meetings and six public hearings with the Vail Planning and Environmental Commission, the Vail Town Council got its first look at the plan at its evening meeting on Tuesday, June 5. Council members quickly made it clear that group will also take as much time as needed to work on the plan. Council members still need to decide how to tackle the plan. Council member Kim Langmaid noted that the plan covers a host of related topics. “Environmental sensitivity is a priority,” Braun said. The current draft plan has defined a vision for current and future trails, Braun said. It also provides recommendations about which trails could be improved or added and which should stay as they are — or possibly be closed. Given Tuesday’s introductory look at the plan, there wasn’t much public comment. But, he added, the current proposed federal budget slashes funding for trails, so local governments and groups will have to do more for themselves. Hoblitzell also noted that the local group is still aiming for a “gold” regional designation from the International Mountain Biking Association. The county currently holds a silver designation for its trails and amenities. Pete Seibert, son of Vail Mountain’s co-founder, applauded Hoblitzell. But, he added, the trails portion of the plan needs to take a close look at “social” trails, unofficial trails that still get significant use. Eagle Valley Land Trust Executive Director Jim Daus praised the effort that’s gone into the plan so far. Daus offered help to the council as it moves forward with the plan. Moving forward on something council members want to parse — “almost line by line,” council member Greg Moffet said — will require a plan. Braun said that plan will be presented at the council’s meeting on Tuesday, June 19. After that, expect several afternoon work sessions about the plan, followed by at least two evening public hearings. The process could stretch into the fall. Vail Daily Business Editor Scott Miller can be reached at smiller@vaildaily.com (mailto:smiller@vaildaily.com) and 970-748-2930. Those topics range from protecting environmentally sensitive property to what land might be useful for, from municipal purposes to trails. 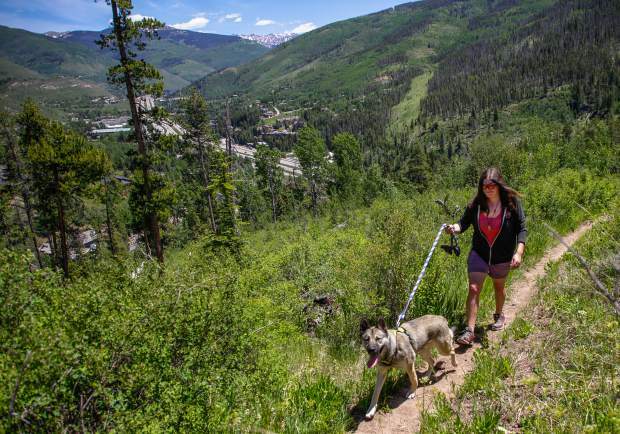 In fact, it was a 2016 proposal to renovate the Vail Trail — a narrow path that runs roughly from Golden Peak to the Vail Golf Club — that prompted town officials to revisit the plan. The ideas for the Vail Trail brought often-intense public reaction, from mountain bikers who wanted the trail expanded to — mostly — longtime residents who want the trail preserved largely as-is. That debate prompted a new look at the plan. As the plan was being drafted and reviewed by the planning board, a January symposium gave the public a sobering look at the decline in local wildlife populations. Planner Tom Braun, who the town has hired to help create the plan, said wildlife will be one of the plan’s focal points.